Every team has had their fair share of bad trades. The Montreal Canadiens have been around for over 100 years, so bad trades are inevitable. Of course, different eras of the NHL have different effects on the trade market, so for the purpose of this article, I’ll only be looking at trades that have taken place in the last 10 years. In the summer of 2010, the Canadiens had just come off an incredible playoff run that, as the lowest ranked playoff seed, nobody expected them to make. They managed to eliminate two juggernaut teams in the Washington Capitals and Pittsburgh Penguins en route to a conference final loss to the Philadelphia Flyers. 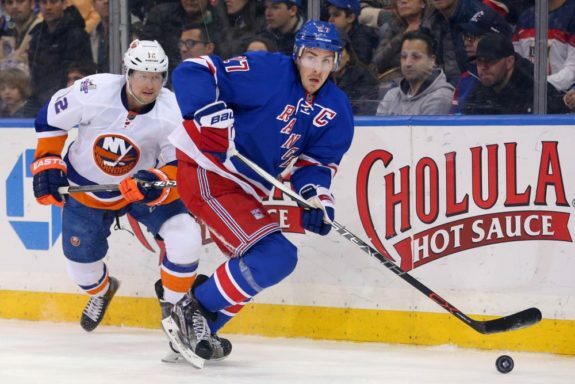 Although they were unable to make it all the way, that run was legendary for the team and for goaltender Jaroslav Halak. Prior to the 2009-10 season, Halak was relatively unknown and had moderate numbers, and even during that season he only started 43 games. It was during the playoffs that he really stole the net. Halak put the team on his back and essentially won the first two series by himself. He faced an average of 31.2 shots per game over 18 games, most of which were quality chances from players like Sidney Crosby, Evgeni Malkin and Alex Ovechkin. At that time, the Habs and their fans were (not so) patiently waiting for Carey Price to blossom into the all-world goaltender he is today. Halak was apparently the better goalie and fans were screaming for the team to move on from Price and give the net to Halak full time. So when the team decided to keep Price and move Halak to the St. Louis Blues, fans were up in arms. Certain fans who were definitely not me had even just driven an hour and a half to the Bell Centre to purchase a brand new Halak jersey. While it was tough to see Halak go, it made sense that the Canadiens would put all their eggs in Price’s basket. They did use the fifth overall pick in 2005 on him, after all. What was difficult to digest was the return on Halak. Habs fans were expecting a monster haul after he demonstrated what he could do as a clear number one goaltender. When it was announced that Lars Eller and Ian Schultz were coming back to Montreal, there was a collective head-scratch. After being drafted 13th overall, Eller played only seven games with the Blues before heading to Montreal but had 57 points in 70 games in the AHL in 2009-10. Still, after becoming a regular NHLer, Eller never managed more than 30 points and was deployed mainly as a defensive player. He ended up being traded to Washington at the 2016 draft and still managed to get a return of two second round picks. Schultz never managed to crack an NHL roster, and while he played 121 games in the AHL, he put up only 29 points in those games and has spent the majority of his career plying his trade in the ECHL. 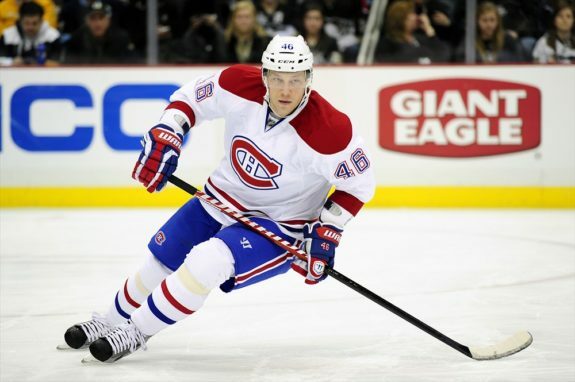 At this juncture in his career, it’s hard to believe that trading Mikhail Grabovski could be seen as a bad thing. Back in 2008, however, he was a 24-year-old rookie with only 27 games of NHL hockey under his belt and plenty of promise. Despite this, the Canadiens opted to move on from the Belarusian and traded him for defensive prospect Greg Pateryn and a 2nd round pick in a rare deal with the Toronto Maple Leafs. A former fifth round pick, Grabovski scored 74 points in 78 games in two seasons in the AHL prior to being traded and appeared primed to be a top NHL centerman. Although he had issues with injuries throughout his career, he scored 20 goals or more in three out of the five seasons he played in Toronto and amassed 208 points in 340 games. He was never really considered an elite player, but he was still an integral part of the Maple Leafs core during his time there. He served as an assistant captain between 2010-12. Greg Pateryn was a depth defenseman during his time with Montreal. He struggled to claim a full-time spot in the Canadiens top six and apparently did not see eye to eye with neither Michel Therrien nor Claude Julien. Eventually, he was shipped out to Dallas with a fourth-round pick for Jordie Benn. The Canadiens ultimately traded the second round pick from this deal to the Chicago Blackhawks for Robert Lang. Lang spent the 2008-09 season with the Canadiens, playing only 50 games but amassing a respectable 39 points. He signed with the Phoenix Coyotes and played out his last season with them the following year. The Canadiens selected Andrei Kostitsyn with the 10th overall pick in the 2003 entry draft. At the time, the club thought they were getting a dynamic offensive talent, and he showed flashes of brilliance during his tenure with Montreal. It was his off-ice actions that forced him to be traded to the Nashville Predators. Not only did he not see eye to eye with former head coach Jacques Martin, but he and his brother Sergei were both rumoured to be involved with certain people around Montreal that you wouldn’t want your players to be involved with. Former GM Pierre Gauthier finally had enough and traded Andrei to Nashville for a 2nd round pick in 2013. He only played 27 total games with Nashville before a late-night partying incident with Alexander Radulov resulted in him being benched during the playoffs. After that Andrei returned to Russia to continue his career in the KHL. Although his NHL career was essentially over after his departure from Montreal, the Habs still got a relatively low return on a 27-year-old former top 10 pick who had three 20+ goal seasons. With the 2nd round pick they received, Montreal selected forward Jacob De La Rose. While DLR has the potential to be an above average third line defensive player, he doesn’t provide much offense to a team whose scoring woes have been discussed ad nauseam. He is, of course, still only 22 years old and may end up being an NHL regular. Over the last couple seasons, players like Daniel Carr, Artturi Lehkonen and Michael McCarron have all surpassed him on the Canadiens top prospects list. These players have also all seen regular NHL minutes and have made De La Rose a forgotten man. He may be more valuable to the club as a trade chip. This trade wasn’t a total loss for the Canadiens, as they got something for a player who seemed destined to return to the KHL anyways, but given Kostitsyn’s potential and goal-scoring prowess, many feel they could have received a far better return. The Canadiens acquired Cristobal Huet in a three-way trade with the Los Angeles Kings and Ottawa Senators that saw the Habs send Mathieu Garon to LA. At that time the Canadiens goaltending situation was less than desirable, as former Hart and Vezina Trophy winner Jose Theodore seemed to be slipping and struggling with consistency. Huet was intended to be a depth acquisition but wound up splitting time with Theodore and playing 36 games in the 2005-06 season. He played so well during that year, putting up a 2.20 GAA and career-best .929 save percentage, that the Canadiens shipped Theodore to the Colorado Avalanche the day before the trade deadline. After dealing Theodore, Huet split time in 2006-07 with Halak and David Aebischer as a stopgap until the Canadiens felt that Price was ready for full-time duties. That would only take one season, as Price was given the majority of the starts during the 2007-08 season, prompting Montreal to explore trade options for Huet. They ultimately dealt him to the Washington Capitals for a 2nd round pick in 2009. Upon arriving in Washington, Huet stepped up his game even further, posting a 1.63 GAA and .936 save percentage down the stretch, helping the Capitals reach a division title. He faltered slightly in the playoffs, however, and the Capitals were eliminated in 7 games. Montreal ended up trading the 2nd round pick they received, along with a 3rd round pick to the Atlanta Thrashers in return for 39-year old defenseman Mathieu Schneider. While Schneider was a stalwart defenseman in the NHL, he was at the tail end of his storied career. He still managed to rack up 17 points in 23 games with the Canadiens, but those would be the only games he would play before signing with the Vancouver Canucks as a free agent. Fans felt as though Huet was an above average goaltender in the NHL during his time and a wasted 2nd round pick was not near enough to appease the fanbase. If you ask any Canadiens fan what the worst trade in the team’s history is, chances are they’ll say the Patrick Roy trade. Maybe they’ll mention the Chelios/Savard swap or the deal for Mark Recchi. This one, though is right up there not only among the worst Canadiens trades of all time but the worst trades in the entire NHL. 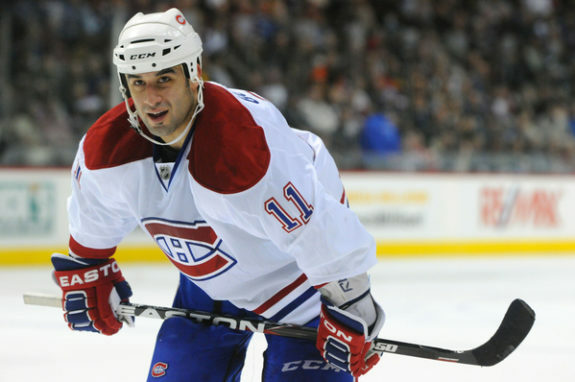 On January 13, 2013, it was announced that Gomez would not play for the Canadiens when the lockout-shortened season. The team sent him home with plans to buy him out before the following season, paying him $10 million simply to go away. While this was obviously a very low point in Gomez’s career, Habs fans rejoiced upon hearing the news. Their team was finally shedding $7 million of dead weight and opened up a slot for a true number one center to step in. Conveniently, the Canadiens had a miserable season the year before and had just drafted Alex Galchenyuk, who made the team out of training camp the following year and hasn’t looked back.